On the 14th July over 150 people from our Church and community came to a buffet supper in the Town Hall in Tavistock to hear about the “The Way Ahead” and plans to celebrate the 700th Anniversary of Tavistock Parish Church. Full details of forthcoming events will be published over the coming months. I want to take this opportunity to thank those who helped make this event possible: David Parkin for his organisation of the event, John Rea, James Teague and Katie Stevenson (from the Diocese of Exeter) for speaking at the event, and Sean Sweeney and the choir of St Eustachius’ Church, together with “Gin and Pimms” for their musical entertainment. A huge thank you also to Cathy Sherlock, the Social Committee, and all the helpers who provided food and much needed help during the evening. I have received many appreciative comments from those who came to the supper and thank everyone involved for making this Church/Community event possible. For many, August is a time for holidays. For most of us, holidays are straight-forward and simple, but for some they have a deeper significance. For some there is a need, almost an urge, to travel and to visit new places. Human beings are, by nature, wanderers and explorers. Our forebears were hunter-gatherers and not settled people. In many cultures, there is a tradition of journeying – nations, tribes and groups “on the move”. In the Bible there are lots of stories of people on the move. The Exodus, where the people of Israel escaped from Egypt and, after a 40 year journey, entered the promised land, is perhaps the most well-known example from the Old Testament. In the New Testament, the first disciples were literally followers of Jesus and they travelled with Jesus from place to place as he taught about the Kingdom of God. They left their homes, their settled lives and their places of work as they responded to his call. There is a tradition within the Christian faith of Christians being people who are on the move and on a journey – literally, followers of “The Way”. The Christian faith has been spread by people who are prepared to travel, and the theme of life as a “journey”, or as a pilgrimage, is at the very heart of our faith. It means that we are called to a life that is not settled, a life in which we are prepared to move on. This is particularly true as we live in a time of significant change. The idea of journeying is, of course, not simply about a physical journey, it is also about an internal journey which involves both the heart and the mind. We know from our own experiences of life that often we travel huge distances inside ourselves because of experiences we have. These experiences can take us to a new understanding of what it is to be ourselves in relationship with God and with others. The Christian life is a journey towards God, in the company of God, and in the company of each other. It is a journey we are all to take and something which is beneficial for us all. This month, if you are able to do so, set a little extra time aside for your journey with God. “Neighbours from Hell” is the title of a popular television programme which reports on disputes between neighbours, some of which have been going on for many years, and all of which are the source of anger and resentment between the parties involved, and the cause of much pain and distress – why is such a programme so popular? An important theme in the teachings of Jesus is that of forgiveness and mercy. These are basic attitudes that every Christian must put into practice. Apart from the command to love one another there is no greater obligation placed on a Christian. But, in some of the circumstances of everyday living, forgiveness is more often talked about than put into practice. It is difficult to forgive. It is demanding, and it can take a great deal out of us. Within families and among neighbours incidents can get blown up out of all proportion; we can become so embittered by injuries and wrong-doings that we may find it impossible to forgive … by our own strength alone. Jesus teaches us to put all our human affairs into a proper perspective and to put our trust in him. In the light of eternity and the shortness of our life span, harbouring anger and resentment is pointless. What comes over clearly in the Gospel is that our ability to forgive others is a measure of the depth of our Christianity. The forgiveness that we offer makes it possible for us to receive God’s forgiveness and to pray in a meaningful way “Forgive us our trespasses as we forgive those who trespass against us.” It is in pardoning that we are pardoned. In the actual circumstances of daily living we are rarely put to the test of forgiveness in matters that are truly painful or emotionally crippling. But, aware of the loving forgiveness of God and his generous mercy shown to all who turn to him, when those times do occur we must be ready to place the situations we face into God’s hands in trust, for, if we are to be true channels of God’s love, then Jesus’s teaching and example must be the standard by which we measure our lives and shape our own conduct. in the strength of Jesus Christ our Lord. Amen. Plans are being made to hold a buffet supper at the Town Hall in Tavistock on Friday 14th July at 6.30 pm to celebrate the life of St Eustachius’ Church and to look at how we can continue to develop our work in the town and the wider community in the years ahead. The event is called “The Way Ahead” and will be an opportunity to look at our future together, our financial situation, our plans to celebrate our 700th Anniversary during 2018, and our hopes and aspirations beyond that. The evening will include entertainment and guest speakers. There are many ways in which we invest our time, energy and resources to witness to our community. Steeped in history, St Eustachius’ Church provides a peaceful, sacred space for all who live in the community, the surrounding areas, and to visitors. It is a major focal point for the town, and a place where many people can, and do, go to find a quiet place in a world which, from time to time, may seem a place of confusion or anxiety. 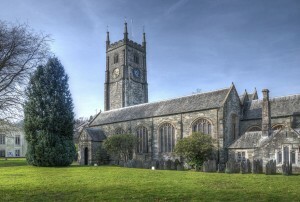 We all benefit from having a beautiful and well-kept Church at the heart of Tavistock. St Eustachius’ Church is not only a place of for worship, prayer, pastoral care and heritage, but also a centre of musical excellence, and a venue for concerts and other events. Tavistock Church hosts everything from choral and orchestral concerts, to the Tavistock Music and Arts Festival, and the highly successful annual Friends’ Christmas Tree Festival, to highlight only a few events which take place during the year. More recently the Tavistock Heritage Festival and the Tavistock Passion have been wonderful events which have drawn many people to the Town. Please come and enjoy the evening with us. For catering purposes the evening is ticketed. You are welcome to apply for a ticket at The Parish Office, 5A Plymouth Road, Tavistock or telephone on 01822 616673. You will be welcome. Please do come. The commissioning and sending out of the apostles, and the promise to them of the gift of the Holy Spirit, are Jesus’s words to those who follow him: “You will receive power when the Holy Spirit has come upon you; and you will be my witnesses in Jerusalem, in all Judaea and Samaria, and to the ends of the earth” (Acts 1:8). Then, St Luke describes Jesus’s Ascension as a physical event. It is comparable to the Ascension of Elijah (2 Kings 2:9). Elisha witnesses the Ascension of his master, Elijah, having been promised a double share of his master’s spirit. Similarly, the disciples look on as Jesus is taken and they receive the Holy Spirit from him at Pentecost. The Book of Acts forms a kind of bridge between the Gospels and Epistles. It describes the way in which the Christian message spreads from the rural Palestinian world of Jesus to the largely urban world of Paul later in epistles, and then throughout the Roman Empire. Whereas the Gospels focus on Jesus, the Book of Acts may be said to focus on people talking about Jesus. This spreading of the Good News about Jesus is possible because of the Ascension of Jesus and the subsequent gift of the Holy Spirit to his followers. His followers are inspired by the Spirit of God to spread Good News about the Son of God: “And you will be my witnesses”. And they were amazing witnesses, witnessing “to the ends of the earth” and passing the task and privilege of sharing the faith on to those who came after them. We, in our term, are all called to be witnesses. Let us recall the words of the Service of Confirmation: “Let your Holy Spirit rest upon them” and: “Let their delight be in the fear of the Lord” … “God has called you by name and made you his own”. As the first disciples were called and then sent out, so are we. Called by name, and called for a purpose. Called not only to be people who talk about Jesus, but also called to be people who live lives that point to Jesus. The theology of glorification, the glorification of the Son of God, is the central theme of the second half of St John’s Gospel from where tonight’s reading comes. For John, Jesus’s final story begins with a supper – not a Passover supper as the synoptic tradition understood, but with a supper preceding the Passover. Jesus is alone with his chosen disciples, including Judas. Jesus knew that his hour had come. The powers of darkness were closing in – Satan had already put it into Judas’s heart to deliver Jesus up to the authorities. And Jesus – knowing that his Father had put everything into his hands, and that his story, which began with the Father, would end with his return to the Father – sets in train a series of events that would lead to the cross and to his glorification. For us, of course – from our perspective, there is a paradox – we see betrayal and injustice that will lead to persecution, suffering and death. Victoria, in her poem which speaks of sun and moon, light and dark, day and night, places this paradox before us. Matthew, Mark and Luke in their gospels mainly make a contrast between two ages – between this age, and the age to come. John however, in his Gospel, makes a contrast between two worlds – the world above and the world below: “You are from below, I am from above; you are of this world, I am not of this world” (Jn 8.23). It is into this world, which stands in contrast to the world above, that Jesus comes to be light (Jn 11.9). This world is the realm of darkness, and Jesus is himself the light (Jn 8.12). The sun rises in the sky, as if to show itself to us in all its brightness and freshness – “What was come into being was life”, John records at the beginning of his Gospel, “and the life was the light of all people” (Jn 1.3b-4). And Victoria writes: “It was night – the horizon swallowed the sun; it was night, rainbows turned grey – painters wept. The moon showed her fickle face, thieves took joy from that place” – “and it was night” (Jn 13.30). During Holy Week we are presented with the reality of darkness. It is the reality of human betrayal. In spite of the fact that light has come into the world, human-beings love darkness rather than light. Those for whom Jesus had been born refuse to come to the light because their deeds were evil. In John’s Gospel the crowing evil is hatred of the light – unbelief in Jesus. Jesus’s opening words, recorded by John, deeply penetrate our being – they expose the weakness of our nature: “Truly, truly, I say to you, one of you will betray me” (Jn 13.21). In the darkness of this moment, to whom does Jesus speak? It is far too easy for us to glance knowingly at Judas – to point the finger at him and away from ourselves – for this is the story not only of personal betrayal, but of human betrayal – betrayal by humankind: “It was night, thieves took joy from that place” – and then Victoria exposes the raw truth of the moment: “stars strayed far away – and someone slept”. “Stars strayed far away and someone slept”. We are brought face to face with the reality of human betrayal. Judas goes about his business and it was night. He goes out into the night – not only into the physical night where the rays of the physical sun could not penetrate, but also, away from Jesus’s presence – into that spiritual night where the light of the true sun did not shine. “And someone slept”. Where was the blind man who had received his sight? Where was the lame man who had been healed? Or the sick Gentile boy who had been made well? Where were the hungry who had been fed, the lepers who had been cleansed, and the deaf who could now hear? And where were Jairus’s daughter, and the widow’s son, and Lazarus, all of whom Jesus had raised from the dead? “Stars strayed far away and someone slept” … “Is it I?” We are brought face to face with the reality of human betrayal. We are brought face to face with our own vulnerability and weakness. God’s Son is betrayed, and someone slept.